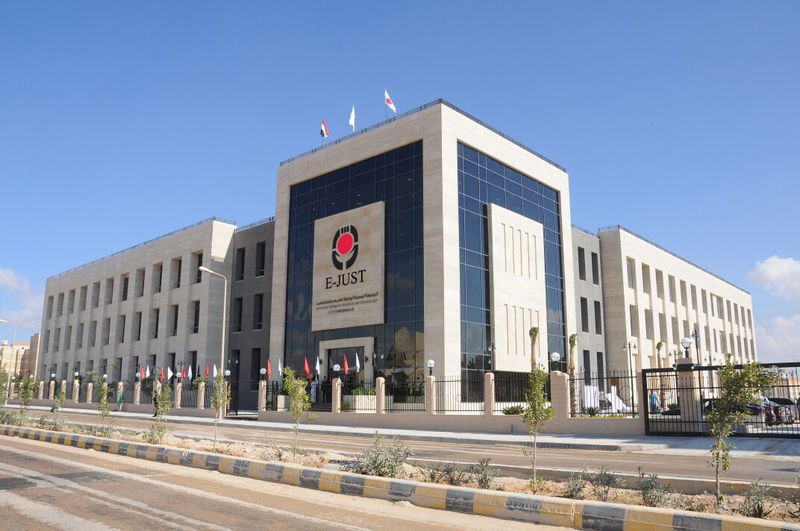 Minister of Higher Education and Scientific Research (MHESR) Prof. Khaled Abd El-Ghaffar, witnessed the graduation ceremony of E-JUST 13th students batch. The graduates obtain their MSc and PhD scientific degrees from the Egypt-Japan University of Science and Technology (E-JUST). Among the presence was Japanese Ambassador in Cairo Prof. Takehiro Kagawa, Vice President of Japanese International Cooperation Agency (JICA) Noriko Suzuki, and Egypt-Japan University of Science and Technology (E-JUST) President Prof. Ahmed Al-Gohary. The graduation Ceremony took place in one of the major hotels in Cairo. During his speech, the Minister congratulated the graduates and the E-JUST family. Besides, the University scientific departments, faculty staff members and employees for all the academic and social care they provided to their students. Confirming the important role of the state in delegating scientific missions so that the Egyptian student feels the importance of the country in developing their scientific potentials. Besides, Prof. Abd El-Ghaffar pointed out that celebrating new batch of E-JUST postgraduates came after they received distinctive amount of training and scientific preparation. Their studies in different Engineering fields qualify them to meet the market and production needs. In addition, keeping up with the scientific and technological changes in their concerned studying fields. Moreover, H.E the Minister clarified that there are 89 students currently expected to graduate in the next batch. As for the expected registered students in the coming years will have its positive impact on both education as well as science and technology systems in our country. In particular, at this critical stage, where Egypt is moving rapidly for further investments and development. This all goes under the framework to achieve the vision of sustainable development in the scope of the State Plan 2030. Furthermore, the Minister pointed out that the increase of E-JUST students and graduates is a testament marking the success of distinguished Egyptian-Japanese partnership in science and technology. On the one hand, it is also a reflection to the trusted cooperation between Egyptian side represented by the academic institutions delegating their students to join E-JUST or the students themselves who enroll themselves. On the other hand, the Japanese side, who lived the success of the project day by day thanks to the joint support from numerous state and community institutions in both Egypt and Japan. For his part, H.E. Ambassador Takehiro Kagawa expressed his happiness to graduate a new students batch. He also confirmed that E-JUST has achieved remarkable scientific achievements and became a prominent scientific institution not only in Egypt but in Africa and the Middle East. Several students from African countries like Nigeria and Kenia are enrolled in E-JUST. Last but not least, during his speech, E-JUST President Prof. Ahmed Al-Gohary praised JICA’s role in supporting the university to reach the highest international educational standards. He then called the graduates to constantly follow up with all that might arise in their studying field worldwide. Prof. Al-Gohary encouraged the students as well to work on developing their scientific and experimental potentials; to ensure leadership. Finally, Prof. Khaled Abd El-Ghaffar honored all postgraduate students who conferred their MSc. And PhD scientific degrees.